Cryptogramma crispa in England's Lake Country. Cryptogramma cascadensis near Coal Lake in Washington State. Cyathea contaminans, still furled crosiers. Photo by George Schenk. 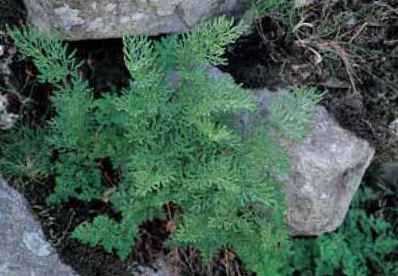 occasionally segregated as assorted splintered genera, are presented under the frond, so to speak, of Cyathea, and follow the definitions of Large and Braggins (2004). The genus name is from the Greek kyathos, wine cup, referring to the indusia that circle the sori on the undersides of the fronds, but not on their margins as in Dicksonia. The approximately 600 species are majestic and solid members of the humid, mountainous, subtropical landscape with scaly (Dicksonia is hairy) trunks to 8 in. (20 cm) in diameter. 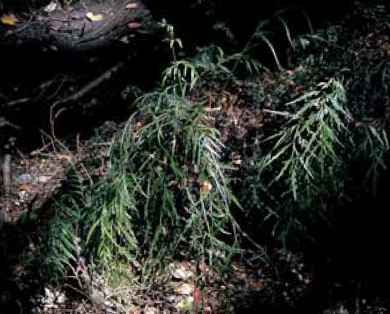 Fronds with long stipes are up to 18 ft. (5.4 m) long, and trunks when young may grow as much as a foot (30 cm) a year. Sori are nestled in cups, like eggs in a bird's nest. Spores are short-lived. A number of species are amenable to cultivation in temperate zones. Martin Rickard (2000) recommends planting them in a moist, wind- and lime-free site and watering the trunks, which house the roots externally, "copiously" until they are established. (And again in dry weather.) However, do not water the crowns during winter. Instead, Rickard recommends stuffing them with straw, thus protecting the growing tip from freezing and ice formation. He goes on to note that plants with a trunk of 2 ft. (60 cm) or more will be less susceptible to cold damage. In questionable climates, where these plants may be vulnerable, enthusiasts put them to bed in winter, well mulched and wrapped in assorted blankets for protection. Foam, bubble wrap, straw, aluminum foil, and fleece or combinations thereof are all used successfully. Alas-tair Wardlaw, a tree fern specialist, who maintains one of the world's best collections in the dark and cold winters of Glasgow, Scotland, has an elaborate system for maintaining his collection under winter stress. (See "Tree Ferns" in chapter 2.) In addition to protecting the trunk, some growers wrap the fronds for winter insulation. This can cause some breakage, but tends to keep them green. Another option is to toss a layer of horticultural gauze over the entire canopy in frosty weather. 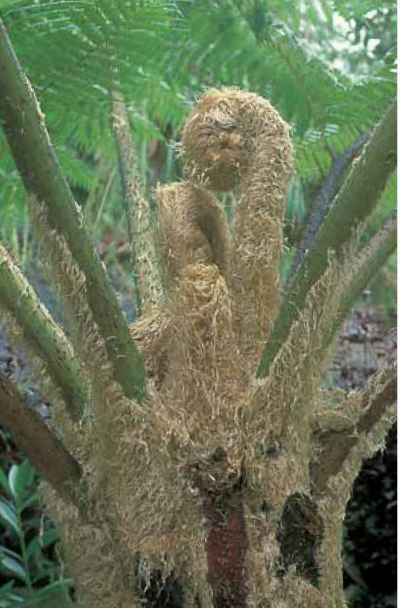 Cyathea can be propagated from spores, but many species are rooted from loglike "cuttings," if you would, of the trunks, sunk in moist soil and surrounded by constant greenhouse humidity. It takes quite some time and they need to be supported and kept moist throughout the process. I have also seen them reduced in height in conservatories by an air layering system. The trunks are wounded and wrapped in a moisture-retentive moss or other sterile material and secured with a cloak of opaque plastic. 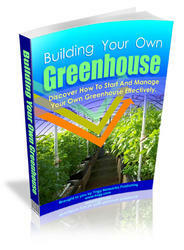 When sprouts emerge, the total plant is beheaded, giving a lower canopy as well as a new plant. Tree fern crosiers offer the viewer some of the best fern-watching, which easily ranks with whale- or bird-watching as an absorbing, even an exciting, visual sharing of the life of a fellow species. Actually, the thrills of the ferner, if gathered at a more leisurely pace, are also far more sustained than any to be had in the sudden sightings of the birder or the ocular whaler. It takes but a little imagination. One may see fern crosiers as heads bowed in meditation. 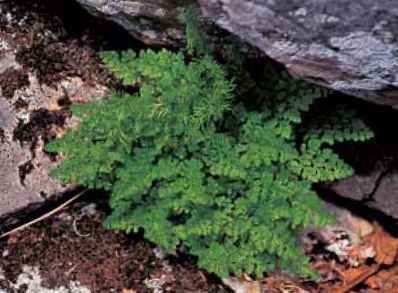 I find it easy to suppose in them an intelligence serene and yet aware, a gathering of will toward the coming season of the fern, the big push, the pteridotechnic explosion upward and outward. This promise, appreciable and ponderable in the furled crosiers of any fern, is enlarged and intensified, not at all surprisingly, in the huge crosiers of tree ferns. Those in the picture are as big as the head of some nonhuman critter or another. I am disinclined to anthropomorphize them. With their dense pelt of palest ochre-yellow hairlike scales, surely they [crosiers of Cyathea contaminans] belong to some furrier mammal, perhaps a sloth. In some other tree ferns the color of the crosier fur is exactly that of orangutans.